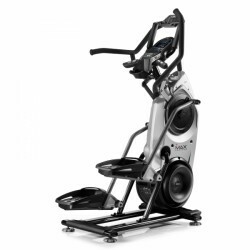 The Max Trainer M7 combines joint-gentle whole body workout of an elliptical cross trainer with the high calorie consumption of a professional stepper. The interval programme of 14 minutes guarantees a maximum of calorie consumption within shortest time - even 48 hours after training! 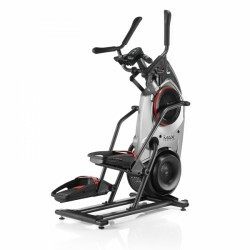 The Bowflex Max Trainer M5 offers a cardio training of the next generation. The Max Trainer offers better training results in a shorter time and is absolutely joint-gentle. 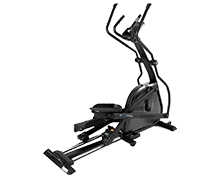 The optimal integration of the torso and the perfect combination of training programs make the Bowflex Max Trainer M5 one of the most effective training equipment on the market. The Max Trainers M3, M5, and M7 are absolute innovations of the company Bowflex and are already among the most trendy fitness machines worldwide. Highly intensive whole body training with afterburn effect, short workout times at maximum calorie consumption: That's the Max Trainer concept. In addition, the extraordinary fitness machine convinces by a very easy use, joint-gentle movements, functional design, and extremely space-efficient set-up dimensions. „No time for sport“ – that's no longer an excuse thanks to the Max Trainer. The 14 minutes Max Interval programme is ideal for a short workout in the morning, after work or in between. The HIIT training including alternating load and recovery phases will push you to your limits and will maximise the training effect. Highly intensive training is ideal for losing weight, because it is proven that it offers a higher calorie burn with a considerably shorter training time, even 48 hours after the training. M7: the top model among the Max Trainers, 20 resistance levels, 11 training programmes, four user memories, hand pulse sensors, bluetooth, and Smart-Max technology adjusts the resistance to your individual fitness level. The Bowflex elliptical cross trainer grows with your training progress, so that the Max Trainer offers you new challenges again and again to extend your own limits even after weeks and months. Beginners appreciate the guided movements for a safe HIIT. Advanced users increase their HIIT training, for instance, by integrating more and longer load phases or by increasing the training resistance.